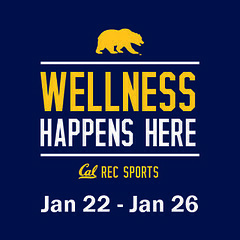 Cal Rec Sports welcomes you back and kicks off the New Year with a week long event featuring great giveaways, sponsored programs and classes. Wednesday, January 24th: Learn more about our programs and job opportunities including IMs, Aquatics, Rec Ops as well Fitness. The fun begins at 4pm to 7pm. A schedule of sponsored fitness programs and classes will be available 1 week before the event. These classes and programs will have giveaways before or after they end.